Arnold Dolmetsch began making the little medieval harps in 1932; he died in 1940. On this page I will discuss people who played these instruments at that time. For later players of Dolmetsch harps see the Legacy page. There are a number of references to the “first” of these harps being made for the Scottish harpist Heloise Russell-Fergusson in 19321. This “first clarsach” had an inscription on it. I imagine that Heloise got interested in reviving the ancient traditons, and approached Dolmetsch. 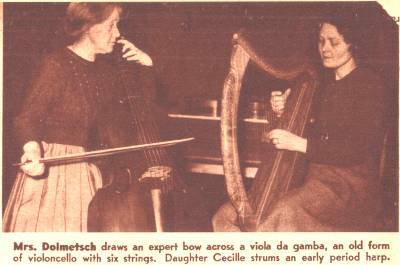 However, she sold the “first clarsach” in 1945, and according to the person who acquired it then, Heloise didn’t play it, but kept it as an ornament. Heloise used a Clarke Irish harp for her professional performing career; the Clarke harp is the one she plays on all of her published recordings and also is the harp that is shown in all of the photos of her I have seen. Mabel Dolmetsch played these harps of course. There is s photo of the Dolmetsch family, including Arnold with an archlute and Mabel with a vihuela, and a young girl with one of the harps4. Mabel continued to play the harps after Arnold died. I have spoken to a couple who went to Jesses, the Dolmetsch house in Haslemere, for dancing practice in the 1950s, and who remember hearing Mabel playing the wire-strung harp in the kitchen as they passed by. Arnold wrote to Heloise in July 1932 that “I have not delivered any although I have sold three”5. I would be interested to find out who else had one of Arnold Dolmetsch’s harps in the 1930s.